In these pages, Cooke will honor you with the story of a journey from depression to joy. He writes with depth, as this is his story. He also writes with immense understanding, for he has wrestled intimately with the details of the journey from legalism to grace. Have you ever felt driven to please a demanding God? Cooke knows that perspective well. His “god” was a legal monster, a deity who was never satisfied and whose love must be earned. Interacting with such a “god” left Cooke exhausted and in despair. But then he discovered the real God, the God whose love is not conditional but offered freely. And Cooke – in surprised delight – found himself living without effort in ways that pleased both him and God. As he let go of striving to please God, he learned that God’s pleasure is indeed free for the taking. What happened? 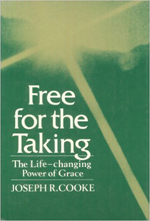 In theological terms, Cooke escaped from the law and learned grace. In personal terms, Cooke found love and joy. Are you exhausted by your efforts to “be good”? Have you distanced from interacting with a “god” whom you can never satisfy? Before you settle for either exhaustion or distance, I suggest you read Free for the Taking. Cooke’s insights and suggestions for building grace into our feelings, perceptions, and relationships could well change your life.